No matter how often Scripture tells us that “God’s ways” are not the ways of humanity, many of us still see our relationship with God in terms of our human social values. Each of today’s three readings reminds us how God often acts in unexpected ways. I’d like to think that I don’t have “geographical” biases, but I read recently how some advertisers have actors speak in a generic British accent because people unconsciously associate it with “high quality?” I thought of all the accents I hear within our media, and was ashamed to realize how many I associated with certain personality traits. We may think it strange that the people of Jesus’ time believed nothing of value could ever come from a two-bit town like Bethlehem, yet if Jesus were to be born into our world today, would we be any more open to the idea that God might choose a teenaged Somali or Syrian girl from an overcrowded refugee camp to be his mother? From our youth, we have been instilled with a value system that is based on merit and reward. We may chuckle when young children work hard to “be good” in the weeks leading up to Christmas to avoid being put on Santa’s “naughty” list, but we sometimes treat our faith in a similar way. We make promises to God to be better, pray and go to Mass more often and give up worldly comforts for a period of time, in the hope that God will look more favourably upon our request for help. Our second reading tells us that God doesn’t require “offerings and sacrifices” of us, but would be more pleased with a willingness to do his will; to work at becoming more compassionate and merciful people all the time. How often have we been convinced to believe in a product’s worth because a “famous” person endorsed it – even when they have no related qualifications? Haven’t we all, at some point, judged people’s abilities, trustworthiness or integrity based on their age, physical appearance, skin-tone or economic success? Only God would have chosen a teenaged “nobody” or an elderly woman with a mute husband to be the instruments through which God’s greatest gift to humanity was delivered! Each of today’s readings remind us that God doesn’t think or act like we might, but often chooses the most unlikely or insignificant people to deliver his message. Advent is less about keeping the commercial enticements of the season at arm’s length as it to “Wake Up!” to God’s presence in the world and the people around us – especially those society often forgets or deems unworthy. Advent asks us to “Prepare!” our hearts and minds to be more receptive to God’s call to do his will and to “Make Room!” in our priorities to deliver God’s compassion and mercy to those who need it most. 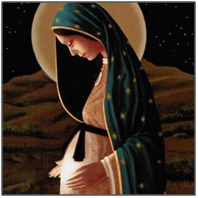 Mary and Elizabeth model what it means to be ready for coming of the Christ. Their entire lives were a “Yes!” to God’s will, even when they had no idea where it would lead them.